Monday UPDATE UPDATE: Everything down in the actuals — Carrie dropped another million in its October-horror tanking. Sunday UPDATE: Three-peat. As called here Friday, Gravity became 2013's first film to own the box office crown three-consecutive weekends, banking another $31M – a minuscule -28% drop –taking its domestic total past $170M. While that's your headline, the cruddy debut for Carrie is a very close second. Considering its the lone horror offering this Halloween season, 'twas a beastly bow for the rubbish remake, lower than last October's Sinister, a movie with far-less fanfare as it entered the multiplex. Three in a row. Not since The Hobbit: An Unexpected Journey at the end of 2012 has a film topped the charts for three consecutive weekends — until now. Behind unwarranted stellar word of mouth and repeat viewings, Gravity has had a vise-like grip on the box office, the sci-fi snoozefest spectacle should plow past the $150M plateau Friday night. The lone newcomer with any shot of scaring up legit business is Carrie, the wretched remake of the 1976 Steven King/Brian De Palma horror classic. 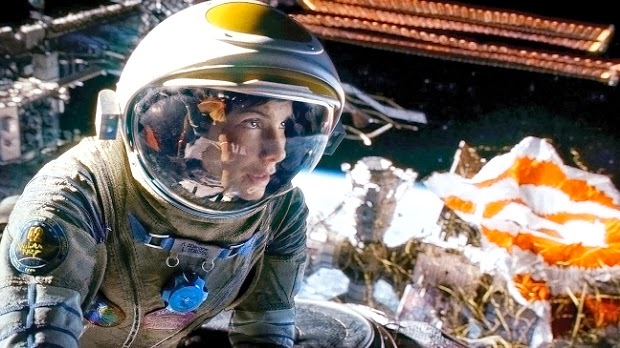 Gravity $32M – Expect another weekend-to-weekend drop of no steeper than -33%. Carrie $21.5M – Its R rating will temper the teen take. Captain Phillips $19.25M – Exceeded the most bullish of forecasts in its $25.7M debut frame. Cloudy with a Chance of Meatballs 2 $9.5M – Just crossed the $82M mark, AKA what Monsters University raked opening weekend. Also: The Fifth Estate $3.75M – Zero buzz for the WikiLeaks drama.